There is something about birthdays I have noticed and find fascinating. When one is little, birthdays are very important. Ask a three-year-old how old he will be on his rapidly approaching birthday and watch his eyes sparkle as he excitedly holds up some chubbly little little fingers and fairly shouts, “FOUR!” Somehow being that year older is the biggest thing that has ever happened to him. As we grow older, other birthdays also represent milestones, like 16, 21, 30, 40, or 65, but somehow they seem to misplace most of their magic. In fact, by the time we are approaching some of those numbers, we would just as soon not bother celebrating a birthday, or at least not with a lot of enthusiasm. It is always nice to be recognized, but we no longer look forward to getting older. Then a mystery occurs. There comes a point where birthdays seem to recapture some of the magic, and we enjoy having them again though perhaps for different reasons. Of course I am not old enough to know exactly when that happens (a-hem), but I have observed it in others. It may seem odd to say, but I am rather looking forward to that experience when the time comes, for reasons I will explain. I have attended three birthday celebrations in the past week. The first one was for three members of my own family as we got together to celebrate the “May birthdays.” This month all three who celebrated birthdays are young adults, and while they enjoyed being together, I must say that the excitement thermometer for being a year older never really got above tepid. The second party was for a distinguished and highly respected gentleman and friend who has reached the significant milestone of 90 years. The birthday was the occasion that brought together something like 200 people to wish him well. He was so gracious to his guests, and clearly appreciated their coming. The third celebration was for a wonderful lady who is 92. Again, many came from miles around to wish her well, and once again I was struck by how charming and gracious she is, not just on her birthday but everyday. And that is where the magic comes in. It may not be magical to be old, but the passing of years seems to bring with it a certain gentle grace, at least for some. The hustle and bustle of the frantic years of building a career, earning a living, raising a family and so on have passed. Family is still there to be worried about of course, and worry they do; that just goes with the territory when you love. But the self-expectation to do something about things we can not change, and probably never could, seems to have gone. I appreciate very much the gentle graciousness that comes to so many with the advancing of years. I am not sure if it takes some of the sting out of aging or not, or perhaps there simply is no sting. Either way, I appreciate the peacefulness of spirit exhibited by these two gracious friends, and am glad to have spent a few moments in their presence. Your grace has quieted some of my stress, at least for a little while. 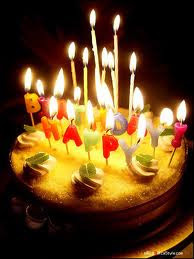 So Happy birthday, dear friends, and thank you for your gifts of grace, to me and to all you bless with your presence.